The Commission on Science and Technology for Sustainable Development in the South (COMSATS) and the OIC Standing Committee on Scientific and Technological Cooperation (COMSTECH), under the patronage of the Higher Education Commission of Pakistan (HEC), organized a two-day national seminar on ‘Policies and Strategies for Successful Implementation of Employment Generating Programmes in Renewable Energies, Biotechnology, Agriculture, Environment and ICTs’. 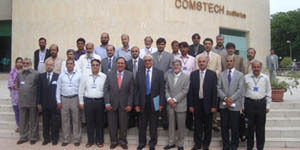 The seminar was held at COMSTECH Secretariat, Islamabad, on 11th and 12th August 2009. The inauguration ceremony was held on the 11th August. The Chief Guest Dr. Ishfaq Ahmad, Advisor Planning Commission of Pakistan appreciated the efforts made by the collaborating organizations for addressing the crucial issue of unemployment in Pakistan for an overall socio-economic betterment of the country. During his remarks on the theme of the seminar, he hoped that it would endeavour to identify the local comparative advantages to assist the policy makers in devising appropriate employment generating strategies. Speaking on the occasion, Dr. Atta-ur-Rahman, Coordinator General COMSTECH deemed employment generation the key issue that needs to be addressed for the uplift of society as a whole. He considered transformation of Pakistan into a knowledge-based economy and imparting right skills to our youth through education the important needs of the hour. He believed that keeping in view the financial and social constraints, a system should be devised that would enable and promote innovation and entrepreneurship. In his introductory remarks, Dr. I.E. Qureshi, Executive Director COMSATS declared employment an important parameter to gauge a country’s economy. He was of the belief that all segments of the society, i.e., public and private, should join hands to address the challenges faced by Pakistan, out of which unemployment has turned out to be one of the most alarming since the unemployment rate during the last couple of years has reached the level of over 7.5 per cent. Thanking the participants and guests, Dr. Qureshi hoped that their collective wisdom and diverse experiences in various fields of Science and Technology would enrich the deliberations of the seminar that could in turn affect the policy decisions on the subject issue. The Seminar, comprising six technical sessions, provided 28 speakers with a platform to establish clear linkages between effective policies and strategies and creation of sustainable livelihoods in targeted areas. Around 50 Scientists, industrialists, government representatives, policy makers, sociologists and scholars participating in the event reviewed existing national policies and strategies and tried to identify some practicable ones keeping in view the socio-economic circumstances currently prevalent in the country. The Seminar concluded with a revitalized commitment on the part of all the participants and speakers to make cohesive efforts to help formulate and implement more effective and sustainable policies for employment generation.